From left,Kiah Townsend, account manager, gradireland; Dr Majella Giblin, Academic Programme Director, MSc International Management, NUI Galway; and Paul McClatchie, Founder, Engage People. 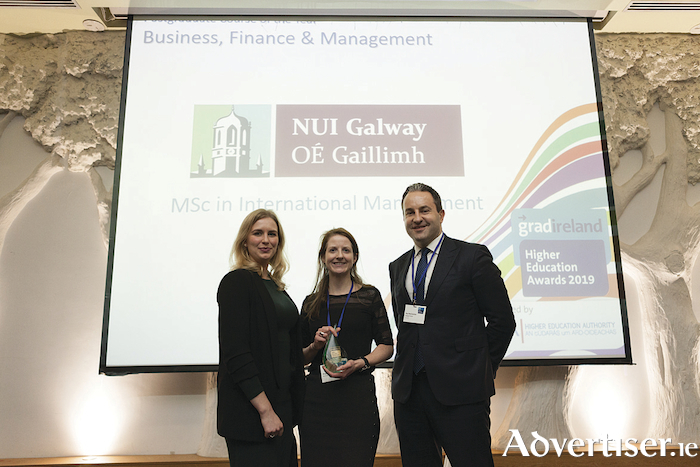 NUI Galway was awarded the ‘Postgraduate Course of the Year in Business, Finance and Management Award’ at the recent national gradireland Higher Education Awards 2019 which took place in Dublin. This year, the prize was awarded for the University’s MSc in International Management programme. This is the second time that this programme has won this accolade, last winning best programme in 2013. Judges commented on the MSc in International Management being consistently strong throughout, and were impressed by its innovative approach and resources. The NUI Galway MSc International Management programme, delivered by the Management Discipline at the J.E. Cairnes School of Business and Economics, is highly regarded nationally and internationally as a programme through which students develop the skills, knowledge and global mind-set required for working in an international context with large multinational corporations or small born-global start-ups. Potential applicants interested in applying to participate in the MSc in International Management can contact Dr Majella Giblin at [email protected], or visit http://www.nuigalway.ie/business-public-policy-law/cairnes/courses/taught/international-management.html for more details.